Throughout the month of February 2019, seventeen items relating to Israel and/or the Palestinians appeared on the BBC News website’s ‘Middle East’ page, some of which also appeared on other pages. As has been the case in previous years (see ‘related articles’ below), the BBC News website continues to cover Israeli affairs far more extensively than it does internal Palestinian affairs. On February 18th an article by the BBC’s Addis Ababa correspondent Emmanuel Igunza appeared on the BBC News website’s ‘Africa’ and ‘Middle East’ pages under the headline “Niger man deported by Israel marooned in Ethiopian airport”. “He had been living in the Middle Eastern state since 2011, having left Niger’s north-western Tilaberi region as a 16-year-old in search of a better life. He said he paid traffickers to take him across Libya and Egypt before he entered Israel by foot. “After several months in detention, Israel issued him an emergency travel document and put him on an Ethiopian Airlines plane, via Addis Ababa, to Niger in November. But on arrival in Niamey, Niger’s capital, he was refused entry by Niger’s authorities who alleged his travel document was false. “After more than a week of being detained in Niger he was deported back to Israel. But Israel refused to accept him and detained him again for several weeks. “They tied my hands and legs and forced me into a plane back to Niger which refused to accept me again,” the 24-year-old said. “Muhamad tells me he has been deported twice from Israel in 2018. When he returned to Niger the first time, Muhamad’s Israeli travel documents were still valid, so he turned around and booked another flight back to Israel. When he arrived in Israel, authorities confiscated his travel documents and deported him again back to Niger. When Muhamad returned to Niger the second time, authorities requested proof of citizenship but he failed to produce valid documents, either Israeli or Nigerien, to support his citizenship. “Israel’s immigration department defended itself, saying in a statement issued to the BBC that Mr Muhamad had been deported because he had been in the country illegally. “He is a citizen of Niger. It has nothing to do with us because he was expelled from here and when he arrived in Niger, he refused to co-operate with the authorities. How is Israel connected? He is not an Israeli,” the statement said. It rubbished [sic] allegations that the emergency travel document was a fake. In addition, Igunza gave generous promotion to the view of a campaigning NGO which the BBC has quoted in the past in stories relating to African migrants. “An Israeli non-governmental organisation working with migrants and refugees said Mr Muhamad’s case was similar to that of other migrants expelled from Israel. “Other migrants deported from Israel with the Israeli travel document have been refused entry to their countries of origin, or other countries en route, because the authorities claim the Israeli travel documents are false, ” the Hotline for Refugees and Migrants said in a statement. It also wants Israeli officials to investigate Mr Muhamad’s allegation that he was brutally assaulted while in detention. Additional signposting to readers of this article comes in the form of an embedded video dating from March 2018 titled “The Eritrean runner fearing deportation from Israel”, an image captioned “Many migrants who enter Israel illegally end up in detention centres” and a link to a report from February 2016 by Kathy Harcombe titled “Israel’s unwanted African migrants”. It is hence amply clear that BBC audiences were steered towards the view that it is yet another story about Israel’s treatment of African migrants rather than one about Niger refusing to give entry to one of its own citizens following his deportation from a country which he entered illegally. 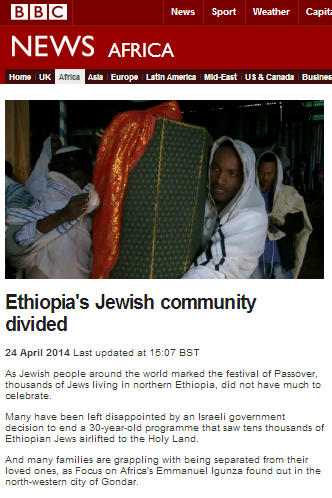 Nearly five years ago a filmed report titled “Ethiopia’s Jewish community divided“ was broadcast on BBC World News television and promoted on the Middle East and Africa pages of the BBC News website. “As Jewish people around the world marked the festival of Passover, thousands of Jews living in northern Ethiopia, did not have much to celebrate. As was noted here at the time, the BBC’s correspondent left out some very critical details in his story about “the last Jews of Ethiopia” – the most obvious one being that the Falash Mura are Christians whose Jewish ancestors were converted by Western missionaries from around the end of the nineteenth century.